A young woman, Jennifer (Jennifer Connelly), arrives at an exclusive Swiss girl's school. She just happens to be able to telepathically communicate with insects. One night while while sleepwalking, she witnesses a violent murder. While running away, she encounters a forensic scientist, John (Donald Pleasence), and his chimpanzee lab assistant, Inga. John discovers Jennifer's insect powers and thinks that she may be able to help him solve a series of killings where the victim is decapitated. This is a grab-bag plot if I've ever encountered one, we've got beheadings, chimps, a telepathic heroine and lots and lots of gross-out bug moments. Encase it all in a strange timeless dreamlike atmosphere that only Argento can summon and you've got something fascinatingly bizarre. Even in the nightmare realm of Italian horror, I have a hard time taking Donald Pleasence using a trained chimp as a lab assistant seriously. It feels at odds with the ultra gory murders that occasionally erupt on screen. This isn't prime Argento, but even his less than stellar work can evoke some strange images and moments. Like a lot of Italian horror, the plot gets unnecessarily convoluted, but perhaps that is part of the charm. This is Jennifer Connelly's first starring role and I think she deals with the mayhem just fine. 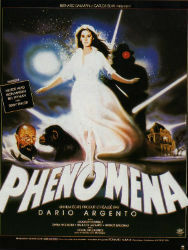 A special note should be made about the final moments of this film, for just when you think that things can't get any more oddball, Phenomena turns around hits you with an over-the-top final moment. I recommended this film on the basis that it's too weird to be missed.